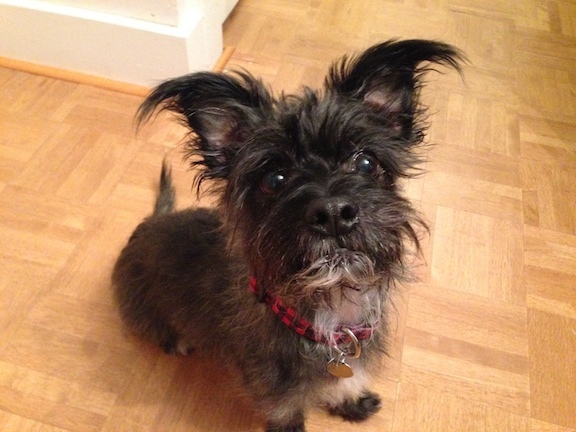 Oscar is a nine year old Cairn Terrier mix. His owners Dan and Jessica contacted me for help after Oscar started to engage in a few unwanted activities and behavior; chewing furniture, marking in the house, not consistently following commands, etc. When I arrived for the session, Oscar was interested in me, but kept a calm energy level that reflected his age. I don’t think he barked once which is pretty unusual for a CT. Whenever I work with an adult dog who has adopted a new unwanted behavior, I always ask what kind of rules and structure the dog’s owners have instigated for the dog. It turns out that Oscar didn’t really have any rules in place. His owner told me that he was so well behaved that they didn’t have a need for any. But now that Oscar was destroying couches and marking in the house, its a good bet he considers himself equal to or superior to his owners. The first step in correcting these behaviors is to help the dog see and identify itself as being in a follower position. Ive found a great way to change this perspective is to add some rules and boundaries. By not allowing Oscar to sit at the same level as his owners (Dogs perceive rank by how high they sit), they can help him see a literal distinction between them. The next time Oscar jumped up on the couch, I had them give him a clear “off” command. Of course Oscar ignored them, so I had his owner put their hand behind him and push him to the edge of the couch, but not off completely. By pushing the dog to the edge so it feels as it may fall off the couch, the dog initiates a dismount on his own rather than falling. Ensuring that the dog is the one who engages in the action or behavior is an important part of the rehabilitation process. I advised them to repeat this technique every time Oscar gets on the couch and suggested they make the couch off limits for at least a month. After suggesting a few additional rules, I demonstrated an exercise to help Oscar practice impulse control while introducing the concept of boundaries. It took less that 3 minutes before Oscar understood the rules of the exercise and fell in line. As soon as he did, I coached his owners through the exercise as well so they can continue practicing it after the session. Because food is such an important and primal activity to dogs, I suggested that his owners adopt a more structured feeding ritual. In a pack environment, dogs eat in the order of their rank and recreating this structure is a greta way for a dog to learn where he falls in the houses hierarchy. I had his owners add food to his bowl, but not allow Oscar to get within 10 feet of it. At first Oscar simply ignored them and headed for his bowl so I stepped in-between to block him. While my position allowed me to block Oscar’s access, he remained right next to the bowl and refused to move away. Clearly the new rule of not being allowed to eat without permission was confusing to him. I slowly moved towards him to back him away, but Oscar didn’t budge so I pushed my foot into his space in an attempt to back him away. Oscar immediately assumed a resource guarding behavior and latched onto my boot for a second before moving back slightly. As he moved back, I moved forward to take the space, but Oscar was stubborn and I had to take several steps to move him away from his food. I backed him completely outside of the kitchen then showed his owners how to communicate that the entrance was a boundary that he cannot cross without their permission. It took a handful of corrections before he relented. Once he sat outside the doorway to the kitchen, I had his owners snack on a bag of chips while keeping an eye on Oscar. By eating in front of him and enforcing a boundary while food was in his bowl, Oscar’s owners were assuming a leadership position. Once they finished their snack, they gave him permission to enter the kitchen and eat his food. I suggested that they start the ritual with Oscar outside of the kitchen for the next week or so to give him a chance to get comfortable with the new feeding ritual. By adding these new rules, boundaries and structure to Oscar’s daily life, his owners will be able to assume a leadership position from his perspective. This will enable his owners to disagree and correct him when he engages in unwanted behaviors and also help reduce Oscar’s belief that its ok for him to chew or mark inside their home.